Tarpon Springs, Florida (the sponge capital of the world) is home to many residents who take pride in their Greek heritage. We offer party rentals in the way of inflatable bounce houses and other entertaining features to the always fun loving and industrious people of Tarpon Springs in Pinellas County. Our family owned and operated business is called Done Rite Party Rentals. We rent bounce houses and water slides for any and every occasion in Tarpon Springs. Our inflatable bounce castles and houses come in assorted themes and our water chutes are available for both young and old. When visiting the town of Tarpon Springs it is easy to see the peaceful family-like atmosphere of its people. When Tarpon Springs folks aren’t working on their famous sponge docks or running their family friendly cafes, a segment of its population can be seen playing cards in storefront meeting rooms and maybe enjoying a bottle of ancient Greek wine. So it takes no stretch of the imagination to understand that this city celebrates special events in a special way. Birthday parties create fun to the “max” when we provide our bounce houses, moonwalks and water slides. 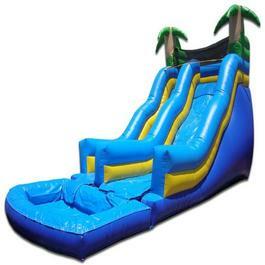 Inflatables can be rented by the piece or we can build a combination of a customer’s choice. ​Our inflatable bounce rides put a smile on every child’s face and provide hours of safe entertainment. Our water slides draw in the adults, as well as the kids. The cooling effect of gliding down a water soaked chute in Florida’s heat is intense. Appetites can be stirred up when the little ones tumble and bounce about in Done Rite Party Rentals. 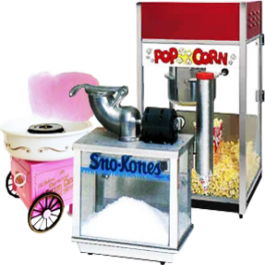 That’s why we would also like to provide treats, such as snow cones, popcorn and cotton candy. All party guests will inevitably feel the need for a beverage. We can make sure that cold soda and water are available, if requested. 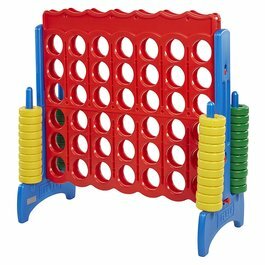 Our party rentals source of outdoor games is vast. Ask for game suggestions. Combining the fun aspect of party games with our inflatable bounce equipment is sure to bring every festive event to a new level of merriment. Done Rite Party Rentals even goes the extra mile by offering tables for rent. We have various table types to accommodate every party event….carnivals, picnics, birthdays, school events, etc. Seating is necessary at every festivity. We have assorted chairs available for rent also. 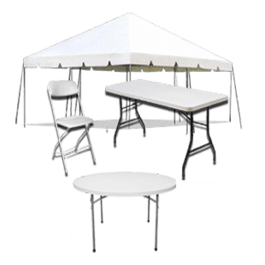 For protection from the elements Done Rite Party Rentals can supply a tent, when necessary. Our party rental staff delivers, sets up and takes down all rented equipment in the city of Tarpon Springs, Florida. Bounce rides and other related party items will be assembled in plenty of time before the start of every event. Done Rite Party Rentals is a company focused on safety. 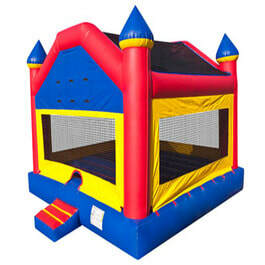 We inspect, clean and sanitize all bounce houses, castles and water slides before and after they have been used. All of our bounce equipment is anchored securely after being set up. We are licensed and insured and in compliance with Tarpon Springs codes and regulations.